SHE MAKES DINNER. SHE DOES WINDOWS. SHE READS BEDTIME STORIES. SHE’S A BLESSING… IN DISGUISE. 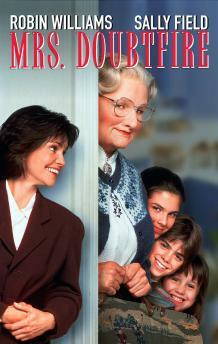 Join us Saturday, Dec. 15th @ 10:00 AM for a FREE special family screening of MRS. DOUBTFIRE starring the late, great Robin Williams. Loving but irresponsible dad Daniel Hillard, estranged from his exasperated spouse, is crushed by a court order allowing only weekly visits with his kids. When Daniel learns his ex needs a housekeeper, he gets the job – disguised as an English nanny. Soon he becomes not only his children’s best pal but the kind of parent he should have been from the start.